Being British, I’ve always struggled a bit with blowing my own trumpet. It’s not quite the done thing, is it, chaps? It’s not quite cricket. But a group of us got together last week at Foyles bookshop on Charing Cross Road to read from our burgeoning novels, and (even if I say so myself) we did pretty bloody well. Every bone in my British body is screaming at me right now to temper that statement (rather well, okayish, marginally above average, slightly better than a smack in the face with a wet kipper) but, screw it, we acquitted ourselves with style and aplomb and it deserves saying. 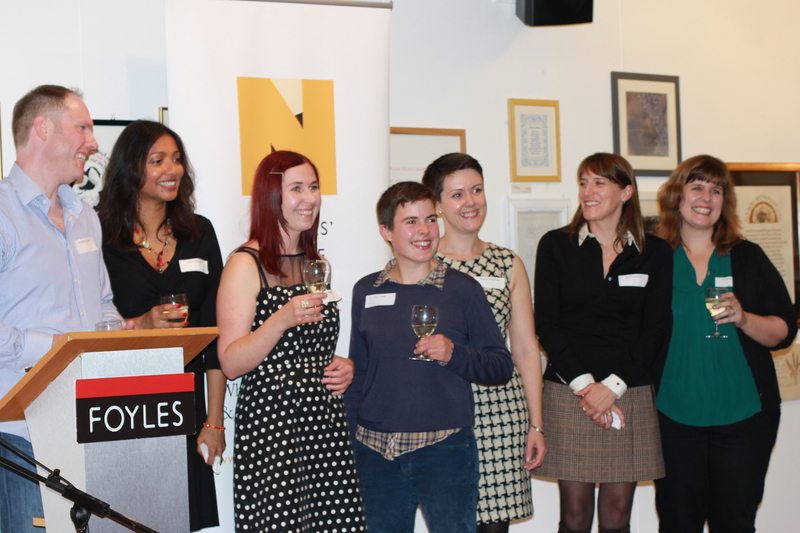 Here’s Laura Stimson saying it much better than me in her blog about the event (on behalf of Writers’ Centre Norwich). 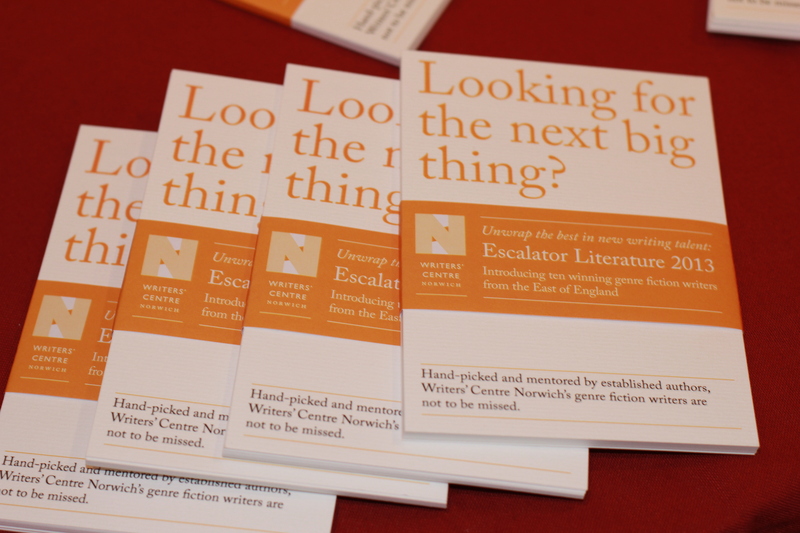 For those who don’t already know, I’ve recently enjoyed a period of professional support from those lovely folk at WCN as part of their Escalator Literature programme 2012/13 (in conjunction with the UK Arts Council). They’ve produced a rather lovely booklet (which you can see in all its glory in the photograph above) containing quotes from myself and my nine fellow ‘Escalatees’ : Mary Nathan, Meghan Purvis, Megan Bradbury, Jonathan Curran, L. E. Yates, Kyra Karmiloff, Sue Healy, Ian Madden and Linda Spurr. There’s some extraordinary talent among them, so do check out their work at the WCN website. That’s me in the spotty dress, clenching my prosecco. And here’s me reading from my novel-in-progress Madder Hall, a psychological ghost story set in the 1970s and very nicely summed-up by my lovely mentor Michelle Spring as a ‘playful and menacing’ mix of the Gothic and the grotesque. (All credit for pics and video to the equally lovely Lucy White and Gordon Smith.) Having always loathed reading in public and, let’s be honest, majorly sucked at it too (see my last post), I found the experience about 67% less hair-raising than expected and feel only a modicum of dread at the thought of repeating it all at the Writers’ Centre’s Salon next month. N.B. The instrument I’m describing in this extract is the glass armonica, invented by Benjamin Franklin in 1761, and here’s what it sounds like in the expert hands of Thomas Bloch. Here endeth the trumpet blowing. Rest assured, normal self-deprecating service will be fully resumed in my next post. ← Channelling one’s inner thespian, darling. Thanks so much, Peter. And right back at you; your blog’s fantastic. A few flickers of interest in the novel so far… but a way to go before it’s finished! Oooh that’s very interesting, Peter. I will indeed keep you posted. Thank you again!